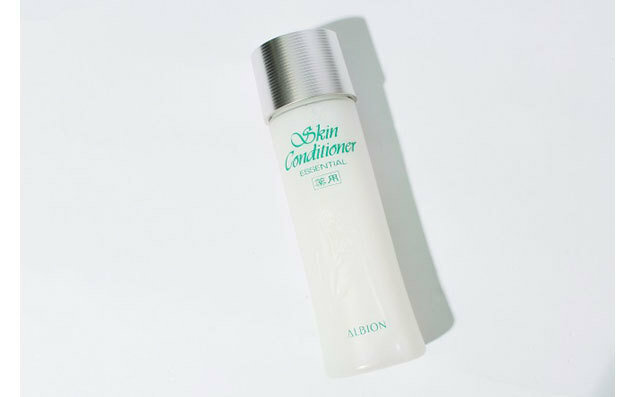 In the @cosme lotion rankings, ALBION's “SKIN CONDITIONER ESSENTIAL”, or "SkiCon," is always one of the most-reviewed products. In the first chapter of this entry, let's take a look at the secret story behind this beloved brand. It was 44 years ago when "SkiCon," was born. There must be more than a few readers who weren’t even born yet! 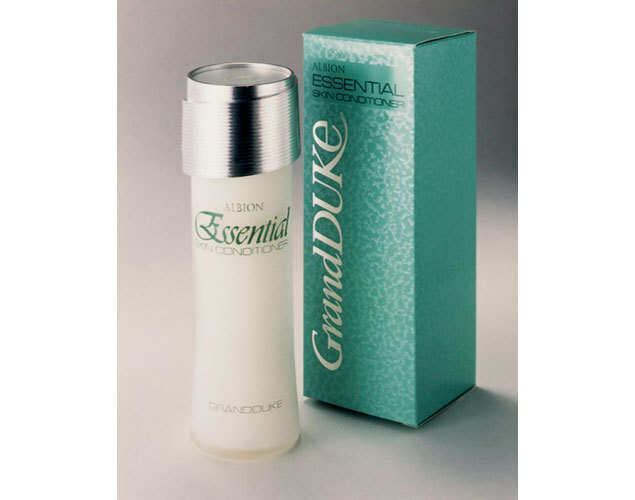 "In 1972, ALBION announced "GrandDuke," an ultra-luxury skin care line. 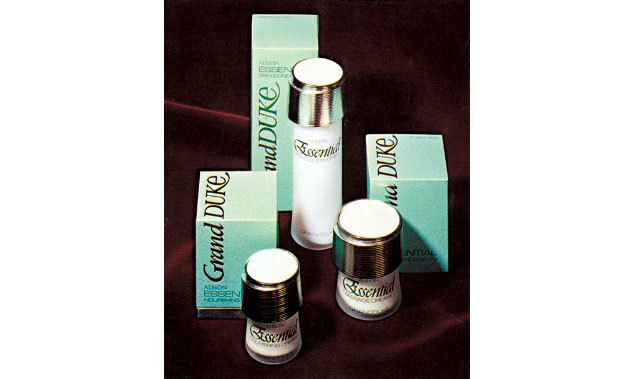 Two years later, in 1974, three more products with more active effects came out with the creation of the "GrandDuke Essential" line of products. 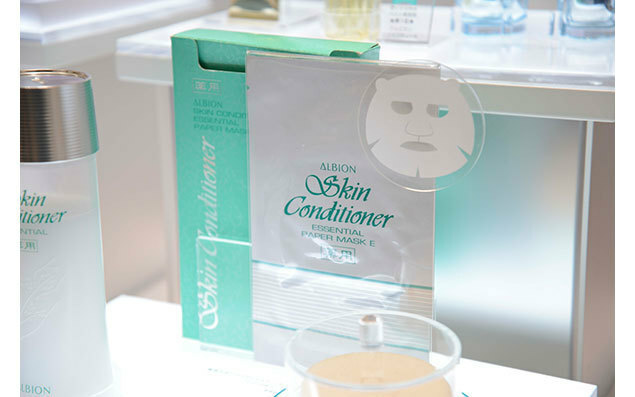 SkiCon debuted as the lotion in that line," said ALBION's AD/PR Manager, Yuki Nikaido. All these years later, there are plenty of people who head into shops set on buying nothing but SkiCon. Even as a stand-alone product, its uniqueness stands out. Still, when it debuted, it was conceived as one of the many other products from the same series. In case you were wondering, the name "Essential" is passed down from that earlier era. At first, SkiCon costed 5,000 yen for 150ml. Most lotions at the time were around 800 to 1,000 yen, so when converted to modern rate, ALBION's lotion was around 20,000 to 30,000 yen! "At the time, staff members complained how financially tough it was to buy SkiCon, even with the staff discount. Buy a couple bottles and there goes your salary. You'd hear that kind of conversation all the time. It really was a luxury lotion," said Ms. Nikaido. When developing SkiCon, the developers were ordered for a product with "quality befitting a luxury line, one that would become the 'face' of ALBION." "Back then, ALBION was less recognizable as a brand. 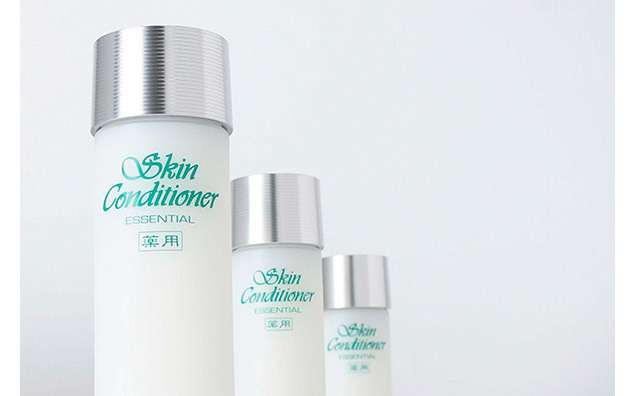 They wanted SkiCon to be a kind of standard-bearer for the brand, so they were after a lotion that was 'original and intensely unique,'" said Ms. Nikaido. "The GrandDuke series was the company's most high-end brand, so it had a pure, clean, white theme to symbolize the so-called white country of Albion. This is why the contents of SkiCon are also white. The head of product planning at the time wanted to make a moisturizing lotion, and not just any lotion — white, with no added coloring. It took several rounds of trial and error to reach the milky white formula we know today, and SkiCon was finally completed. Clear, colorless lotions were in vogue at the time, but the milky white SkiCon became a total sensation. The emulsified formula is made with an emulsification technology that only ALBION can realize, which has been a tremendous gift for the company," said Ms. Nikaido. SkiCon has a cooling, refreshing sensation on the skin, but it still provides instant moisture. To combine those two effects, the water molecules and oil molecules are combined in a milky formula that creates a unique sensation. This is the invisible power of the oil molecules. "Emulsification technology has come a long way by now, but back then, the oils used originally weren't as purified to start with. 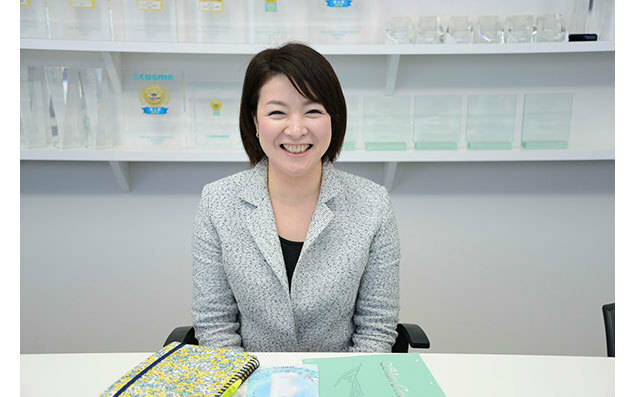 With that in mind, for SkiCon to be a milky white lotion was all thanks to the emulsification technology we developed for making emulsions," said Ms. Nikaido. Since its founding, ALBION had touted the unique benefits of applying an emulsion directly after washing the face. This lotion was developed so the oil immediately goes to work keeping the skin supple. Research into the strengths of oils allowed the company to create this miraculous texture. Other than the milky formula, SkiCon was a sensational lotion in every way. For a revolutionary product, there was one more key point to make sure SkiCon stood out from the crowd: the scent. Even in @cosme reviews, SkiCon’s scent is mentioned as “nostalgic” and “comforting”. Also, a memo from the developer at the time was found. “The scent is described to be recalling of the firmness and dewy glow of the skin like right after taking a bath, and as a scent that describes a beauty that leaks out from inside. 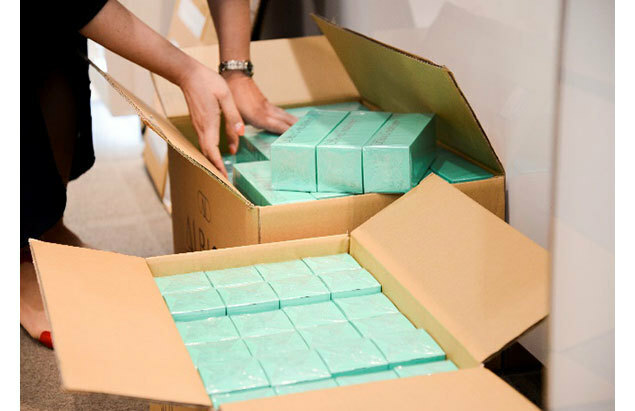 It spells out how much the developers wanted to create a never-seen-before, unique scent," said Ms. Nikaido. There is definitely something about SkiCon's scent that has a fresh, clean feeling, like after taking a shower. It's a mysterious scent with a botanical tone, something that just feels effective, like it's good for the skin. Another revolutionary characteristic was the label for “sensitive skin”. “Nowadays, this is not rare anymore but with many cosmetics out in the market, we recommended this lotion as an emergency lotion for adding or switching to your skincare routine for when your skin is troubled,” said Ms. Nikaido. For such a sensational product, you might thing that SkiCon was met with huge fanfare when it debuted, but Mr. Nikaido tells us otherwise. "It didn't sell amazingly well in the beginning. It took about 10 years to for it to get somewhat successful." That may come as surprising news; the secret to SkiCon's present success was all thanks to a steady campaign to spread the word about SkiCon. The first fans of SkiCon were beauty advisors and wives of store managers that got to try out the product on their own skin. "To start selling the GrandDuke series, the prerequisite was to take a special course at our education center for three nights and four days. 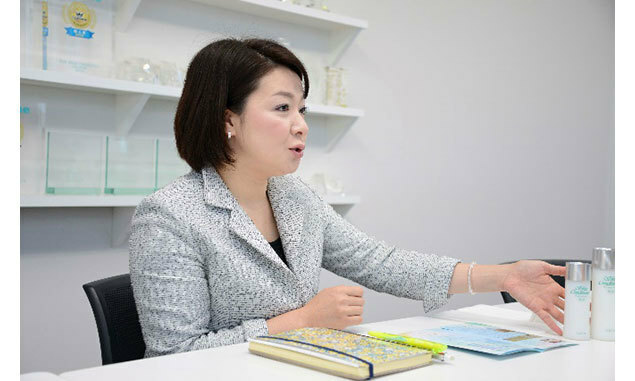 You get to try out the products and understand the real value," said Ms. Nikaido. It seems like a lot of those people ended up being huge fans of SkiCon after they got a chance to use it. Having fallen under the spell of SkiCon, these store workers were excited to show the product to their customers, and so the lotion's fan club continued to grow. "A lot of ideas came out of our discussions with these trainees on how to convey the value of SkiCon to customers," said Ms. Nikaido. One idea came up for customers to first try the product on their own skin, which led to a handmade facial mask with SkiCon. Staff would soak a cotton sheet with SkiCon, seal it into a plastic bag and remind customers to use by the end of today since it’s unprocessed. "At the time, there were no samples or special cotton facial masks like we have now. 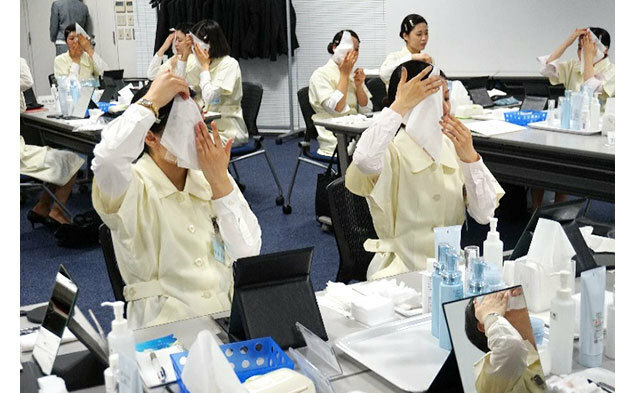 A daily routine for staff was to cut large, towel-sized absorbent cotton everyday," said Ms. Nikaido. "Later, 'beauty mask treatments' that used an infrared lamp and a paper mask infused with SkiCon began in stores," said Ms. Nikaido. This method was more cooling than simply patting the lotion in the skin, while the infrared lamp's heat allowed the lotion to sink into the skin more effectively. Customers who experienced this treatment were amazed at how pleasant it felt, not to mention the astonishing brightening effect it had on the skin, all of which led to a huge increase in the public's awareness of the SkiCon brand. It's been 44 years since the birth of SkiCon, and the best-seller moves up to 3,000,000 bottles of product per year. The lovely scent and beautiful texture are just the same as the day the first bottle was sold, but did you know something about this product has changed since then? "In 1998, the product was certified as a quasi-drug, so it was upgraded to a medicated version. That's when we added the two Japanese characters for 'medicated' to the bottle," said Ms. Nikaido. In 2011, the lotion formula was changed to use only "Kita no Hato," a variety of Job’s Tears grown domestically in Japan. "Job’s Tears grows in places from tropical to temperate climates. But the ‘Kita no Hato’ variety from Hokkaido has been improved over time with more vitality so that it can be grown even in extremely cold areas," said Ms. Nikaido. But the evolution did not stop there. 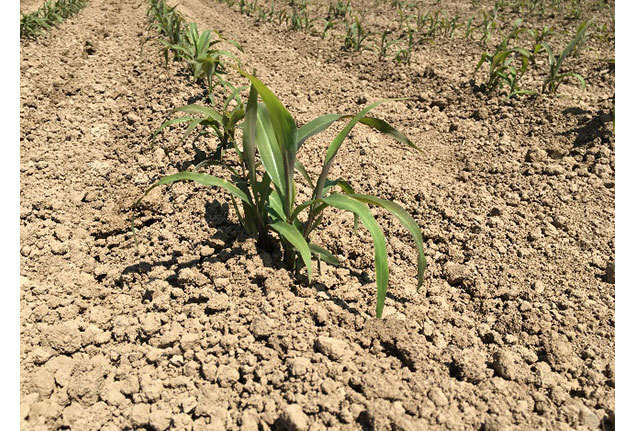 Hoping for a more powerful effect from the plant, the crop is now grown 100% organically. 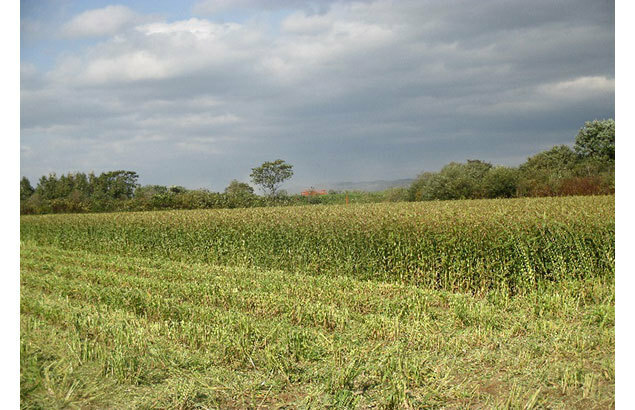 On the hunt for materials to make the product, ALBION met with several organic farmers in the town of Kenbuchi, Hokkaido. In 2017, they announced the use of "Organically Grown Kita no Hato." Kita no Hato is the only Japanese-grown Job’s Tears recognized as Yokuinin for kanpo (traditional Chinese medicine). It is also used for desserts and other food products but SkiCon is the only cosmetic product to make use of it. As it happens, “Organically Grown Kita no Hato” is the only officially recognized variety to bear the "Organic JAS" certification mark. Unfortunately, because Organic JAS is a certification system for food, ALBION cannot use the Organic JAS logo on the SkiCon packaging. With this goodness inside, it's no wonder that SkiCon has gained such a following through the passionate word of mouth recommendations of its users. In our next chapter, we'll take a look at the passion that goes into ALBION's unique staff education process! Now that it's so easy to buy cosmetics, whether online or at drug stores, ALBION is still an advocate of face-to-face sales. One of the reasons for SkiCon's enduring popularity is the "person to person" customer service experience you can only achieve with ALBION. 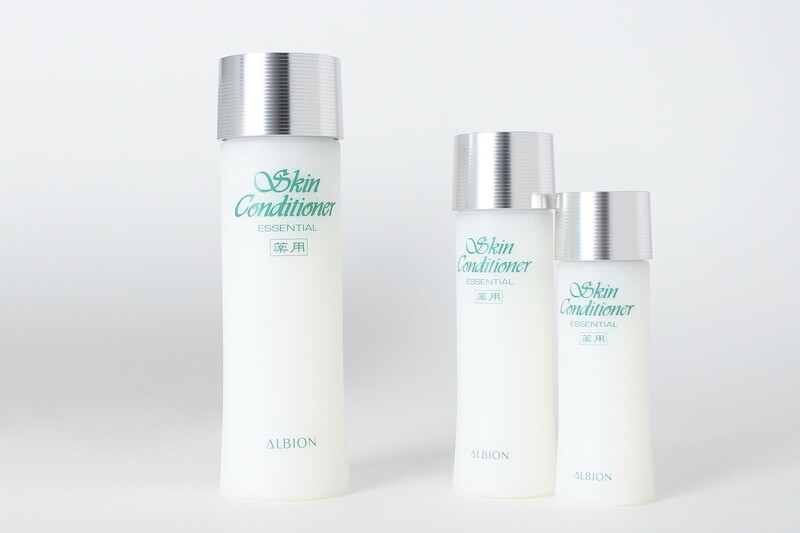 As of 2018, ALBION products are not available online or at self-service retail outlets. Every ALBION product is sold face-to-face in stores. 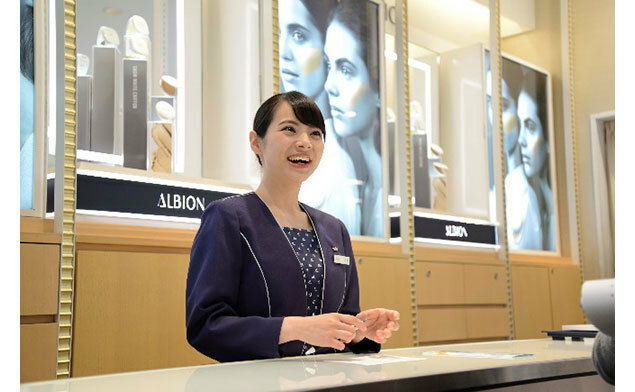 In charge of the training for the "beauty advisors" at the front lines is Yoko Kanamaru, head of Human Resources Development at ALBION. 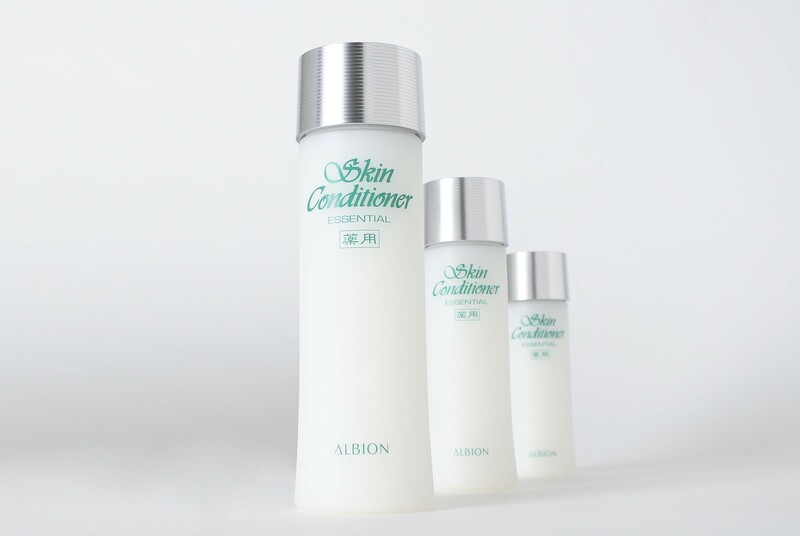 "ALBION's human resource education philosophy starts from ‘be someone fitting to deal with luxurious products’. When the company was founded, the salespeople would even deliver the product to the customer at home. 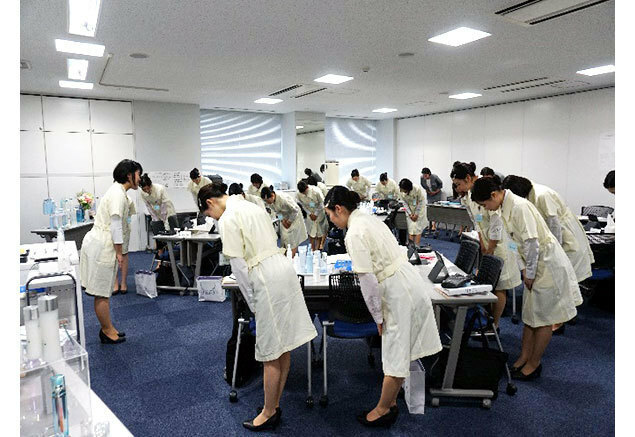 The idea was that they had be put-together before they could have the kind of graceful bearing a salesperson needs to make sure no one feels uncomfortable on house-calls like that," said Yoko Kanamaru, head of Human Resources Development at ALBION. The training regimen for new employees at the time included a one-month stay at the training facility. Starting with basic mannerism such as folding and laying out futons every day, how to open and close sliding doors; every aspect of trainees' comportment was revisited. As training progressed, they would improve their interpersonal skills and manners while interacting with each other. "Although the current training program has been condensed, the overnight training camp format has not changed. Specifically, about half of the new trainees' program is spent on their manners," said Ms. Kanamaru. 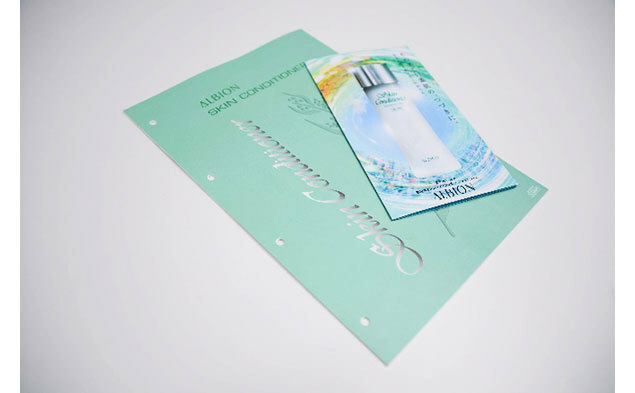 Thanks to this program, ALBION's beauty advisors have nothing to be embarrassed about in any situation. They've even been known as the “best wives”. "Manners, physical bearing, all of that has specific rules. For example, your posture when standing should have your heels together and your toes open at a 30 degree angle. Then there are manners like how a normal bow should be at a 30 degree angle, while a bow for apologizing should be at a 45 degree angle," said Ms. Kanamaru. 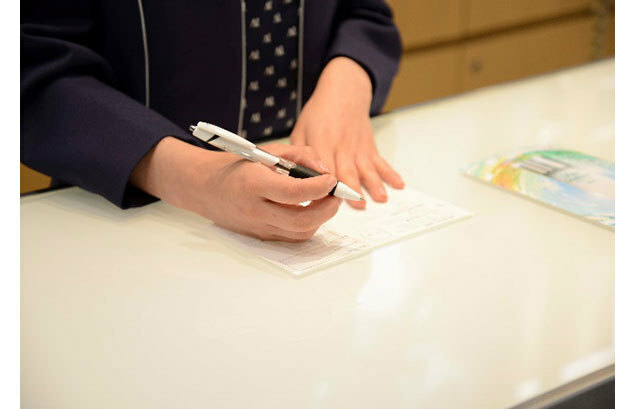 You might think this all sounds a bit too strict, but as Ms. Kanamaru explained, "Behind it all is the notion that actions convey more than words when it comes to customer service. You may think you're providing good customer service, but how you come across to the other person is entirely another story. We take every opportunity to teach new staff that they must always consider how they can put customers at ease, and that manners are crucial," said Ms. Kanamaru. For example, when applying lotion to a cotton pad, it's a big no-no to let the liquid splash out of the bottle. "You should ensure that the label is facing up and towards the customer. Fresh cotton pads should be lifted towards the customer and used ones should be taken away towards oneself," said Ms. Kanamaru. Then the used cotton should be folded inward to the dirty side and neatly placed to the side. "It may not sound like a big deal, but the root of all this is our policy to always think of what we can do for the customers. ALBION's customer service is all about thoughtfulness. We are always considering how to please the customer and doing our best to ensure we put that into practice," said Ms. Kanamaru. "What can I do for this person?" The question at the core of this philosophy extends beyond customer service. Even in our private lives and business practices, this is a vital concept. Taking one of the most important issues in society, ALBION uses manners and takes time to share this value with everyone. "Trainee education also includes time to learn about the products. Of course the sessions for SkiCon are some of the most exciting," said Ms. Kanamaru. Almost all new employees are familiar with the product, and many of them have used it before joining the company. It's no wonder that they might be excited to learn about the ingredients and effects of their beloved SkiCon. "When I was a student, I was having trouble with my skin until I found SkiCon. I was so impressed by the customer service I received that I decided to apply for the company. In a way, I find it really moving to think of how this particular product decided my future," said Ms. Kanamaru. SkiCon is also used for customer service training. Trainees form pairs, with one person playing the role of the customer and the other as the role of a beauty advisor. Using the pamphlet, they explain what makes the product so special. "This role-playing doesn't often go well the first time. People freeze and make mistakes. Some trainees even burst into tears. Still, everyone tries their hardest, and you can really tell that they have a strong desire to persuade the customers why this product is so special. Even I get choked up when they ask me to let them try one more time," said Ms. Kanamaru. As Ms. Kanamaru told us, even without expertise or special techniques, that passionate effort comes across to customers as well as the trainees. One other tricky point for new employees is mastering a perfectly natural smile. "If you're feeling nervous and it shows on your face, you can say the 'i' sound in 'smile' to help your lips naturally curve into a smile. During hard times, we try to keep that sound in mind to ensure customer service with a smile," explained Ms. Kanamaru. Even if all doesn't always go well, ALBION's team members always work together for success. "The trainees' training center in particular is like that. Whenever someone can't do something, the other trainees in the room lend their support and help them practice later that evening. That spirit of helpfulness is really moving. I also get a lot of motivation from working with these new employees," said Ms. Kanamaru. ALBION's employee training is less about education than cooperation. Both the trainees on the learning side and the instructors on the teaching side are all members of the beautician team, which means they always come back to that as a starting point. This common ground means they are always working to grow together. "As an individual, you are standing across from another person. You can't know what the customer in front of you is thinking, or what they are looking for. You only know that they are a customer. That means that you have to start by asking them. Then you must answer accordingly. This responsiveness forms the ALBION model of customer service, which always puts the customer first," explained Ms. Kanamaru. That careful, responsive customer service is put into practice in store, at the front line of the retail experience. 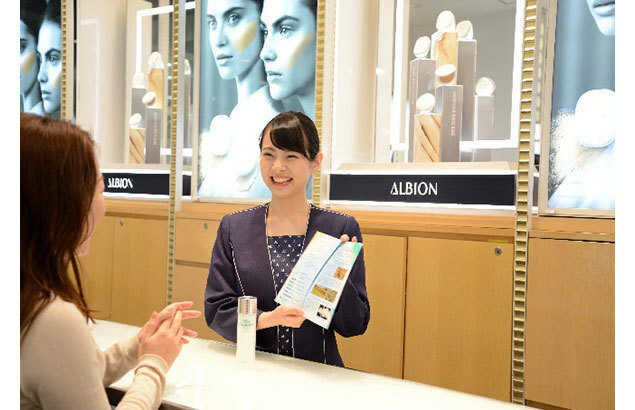 This is Akiko Otani, a beauty advisor at the ALBION counter in the Isetan Shinjuku Department Store. 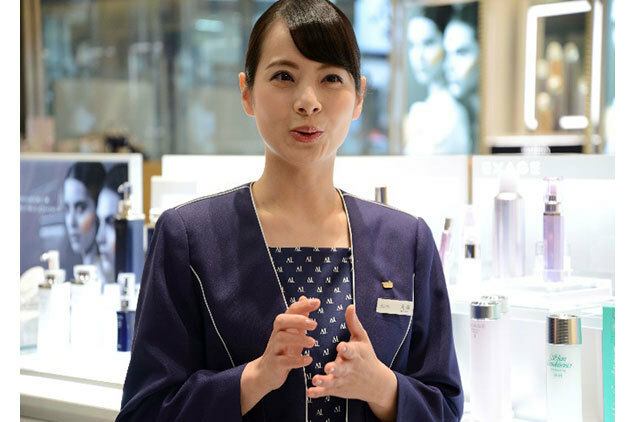 Ms. Otani has been working in the beauty department for seven years. "When you're at the counter, you end up really wanting to talk about the products. But it's much more important to start talking to the customer first. That way you can learn what issues they want to address, or what their ideal skin is. 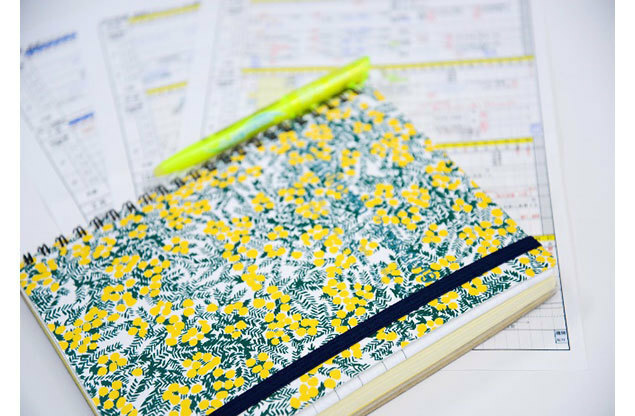 We even try to learn what their daily routines are like," said Ms. Otani. Sometimes that can even include problems at work or other conflicts of the customer's life, since those issues can lead to skin problems. As part of this process, the staff need to orient themselves toward the customer correctly. "Busy people have limited time to spend at the counter, so you have to think about how you can boil down your questions to the main points. When you're showing products, you have to think about whether they might not want to use a lot of different products. Or maybe they’ll use a single product every day," said Ms. Otani. "SkiCon is a lotion I can recommend to anyone, no matter what problem their skin has. All kinds of people love it, from customers in their teens to their 70’s. 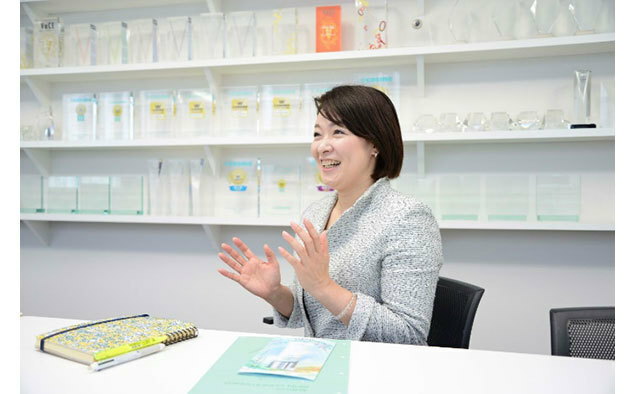 There are also a lot of people who used SkiCon before and came back to using it again after years of trying all sorts of other products," said Ms. Otani. She has worked with many different customers, including a customer struggling with acne. One customers purchased SkiCon, and by the time they returned to the store again, she saw a clear improvement in their complexion. "When I saw their skin and expression, I could tell they tried very hard to take care of their skin. It really made me happy to see that," said Ms. Otani. When your skin is acting up, it's easy to lose confidence and feel a lot of stress. When that happens, it must be really reassuring to have someone give you such kind advice. This friendly, personal customer service is of course one of the big reasons for the growing fan base of SkiCon. With one of the largest beauty floors in Japan, Isetan Shinjuku receives waves of shoppers each and every day. The day we visited, the stocks of SkiCon has just been replenished. "SkiCon comes in three different sizes, but the 330ml bottle is the top seller. Before this weekend, we stocked 1,400 of the big bottle sizes alone," said Ms. Otani. Just before opening the store, the staff efficiently lined up the product on the shelves and prepared to meet the customers for the day. "There are a lot of customers from overseas who come for SkiCon, too. Everyone comes to the counter carrying little shopping lists that say 'Health Water 330,'" said Ms. Otani. It turns out that "Health Water" is the name used for SkiCon in China! According to one explanation, a famous Chinese actress posted on social media, which led to a boom in its popularity. "Whenever customers come in asking for 'san bai san,' I know they mean the 330ml size of SkiCon. Almost all of them come in knowing exactly what they want!" said Ms. Otani. "I've heard a lot of customers who use the product say that their acne isn't noticeable anymore, that their complexion is brighter, or that they can't live without it. I've even has customers say they hate running out, so they keep a backup supply," said Ms. Otani. Recently, there also seem to be more and more men using SkiCon as an after-shave lotion to soothe the skin. "SkiCon doesn't have a very flashy bottle. But it does have an extremely reliable reputation. 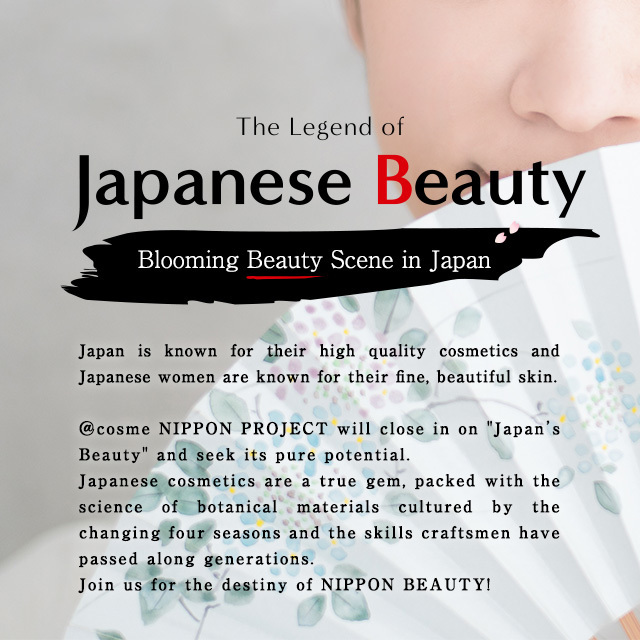 That's why we can confidently recommend it to anyone, no matter how old they are or what skin type they have," said Ms. Otani. The first online review of SkiCon was posted in 1999. @cosme didn't even exist then! Now, 19 years later, this lotion has an unbelievable number of reviews: 24,300 and climbing! We've picked out a few reviews to see if we can zoom in on why people love SkiCon so much. What stand out in the reviews of SkiCon are the comments about acne. Reviews such as "I get breakouts when I don't get enough sleep, but if I use SkiCon, my skin calms down faster," or "I've had problems with adult acne, but this really rescued me." Tt's easy to see that this lotion has had real effects. "The main ingredient of SkiCon is Job’s Tears, which is known in Oriental medicine to have a detox effect," explained Ms. Nikaido. It encourages the removal of waste and toxins within the body, which helps prevent breakouts and irritation of the skin. It also contains glycyrrhetinic acid, which is derived from licorice root and is recognized to have an anti-inflammatory effect. "There are a lot of acne medications and cold medicines that contain it, and acne-sufferers can expect to see an anti-inflammatory effect," said Ms. Nikaido. The synergistic effect of these two ingredients does seem to calm the redness and inflammation of acne. Could SkiCon's uniquely refreshing texture even help tone and reduce sebum production for excessively oily skin? SkiCon has a powerful effect on complexion, with many users remarking that every application seems to brighten their skin. Some people say it's brighteninng, but actually? 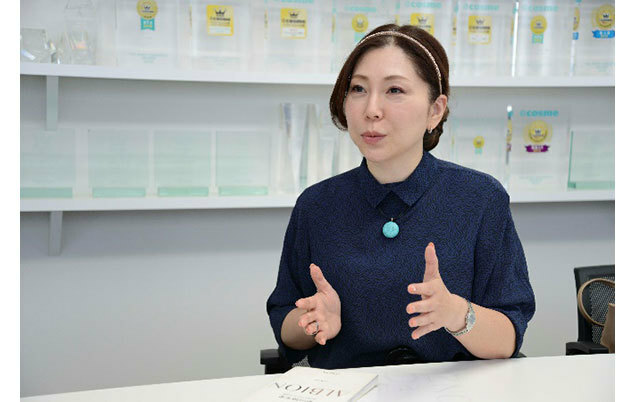 "In fact, SkiCon does not contain any skin-brightening ingredients," said Ms. Nikaido. If that's the case, why do so many people say that just using this lotion makes their skin look brighter? "Job’s Tears is said to encourage the skin's metabolism. It stimulates the creation of healthy epidermal cells, which refines the skin's texture. The skin reflects light more evenly, which is what I think creates a brighter complexion without any dullness," said Ms. Nikaido. 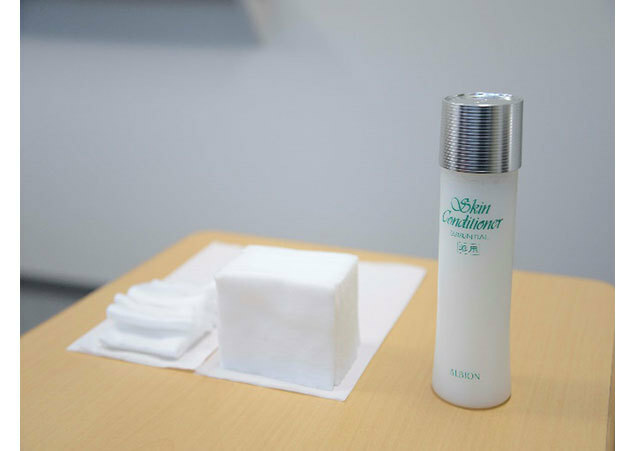 SkiCon also replenishes moisture in the skin, which conditions the outer layer of the skin and results to brighter skin. You can really see the results when you apply these paper masks soaked with SkiCon. In response to consumer requests, ALBION released "SkiCon Paper Mask", a mask infused with SkiCon in 1988. SkiCon is a truly unusual lotion. Some users remark that their acne got better, while others say their pores became less visible with continued use. People mention brighter or calmer skin, with a practically endless variety of effects reported in reviews. "I think the effect on the skin's turnover process definitely has a big effect. When the skin is out of balance, its barrier effect is lowered and both irritation and dull skin occur more easily. The pores also get clogged easier, which can cause pimples. The root cause of all sorts of skin problems comes down to the skin's cellular turnover, which address all kinds of issues," said Ms. Nikaido. The witch hazel extract combined in SkiCon tightens the skin while the horse chestnut extract activates the skin cells. The combination of these extracts directly targets and improves skin concerns; these are the true powers of SkiCon. People say SkiCon has an addictive scent that you'll love right away. @cosme users have also commented that it's relaxing and has an nostalgic scent like makeup on their grandma’s makeup shelf. "SkiCon has a floral bouquet scent. We weren't aiming for a particularly relaxing or nostalgic scent, but I've heard that the theme was to have a memorable, unique scent," said Ms. Nikaido. For 44 years, the scent of SkiCon has not changed, so its those who feel it has a nostalgic scent are probably thinking of it from the standpoint of today's fragrance trends. A lot of mothers and older women have been using it for years and perhaps association may have left an impression on the memories of others? SkiCon has a fresh, pleasant feeling on the skin. Or does it? While some users say it feels instantly cooling or simply refreshing and comfortable, users with some skin types report a unique, tingling sensation. "Tingling? One of the unique characteristics of SkiCon is the stimulation that pleases the skin and leaves a comforting sensation that is long-lasting," said Ms. Nikaido. This pleasant feeling is hard to describe, but if it feels like it's working on the skin, it's not a problem. Still, if you notice redness or discomfort, take a break from using it. ALBION recommends using their emulsion immediately after washing the face in order to soften the skin, then using a lotion to replenish hydration. Using SkiCon is the same. Currently, ALBION has 16 types of emulsion alone, and the question of which emulsions to combine with the lotion has even gotten somewhat trendy. "With SkiCon, you can use it with any of our emulsions and it will have a complementary effect. I think you can feel free to choose an emulsion targeted at your skin issues or intended to give you the results you want. For example, if you are hoping for brighter skin, you can use Exage White. If you are looking for anti-aging, then go for the Excia AL Lifting Emulsion. Then pat on plenty of SkiCon afterwards," said Ms. Otani. Of course, you can also use SkiCon on its own. 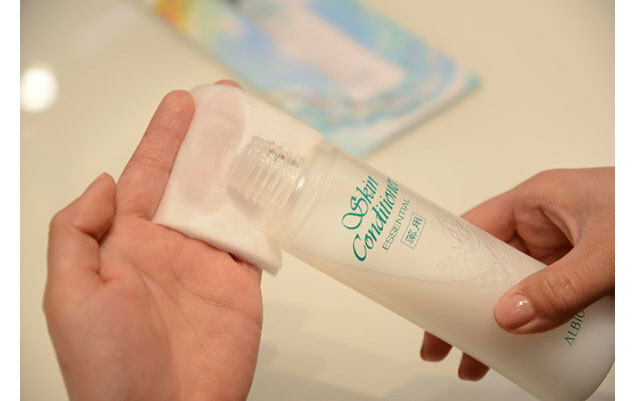 "At night, you can combine it with an emulsion or cream, while in the morning or during summer, there are many people who prefer to use SkiCon in its own," said Ms. Otani. Incidentally, using an emulsion to soften the skin before applying the lotion helps the lotion penetrate into the skin more effectively. 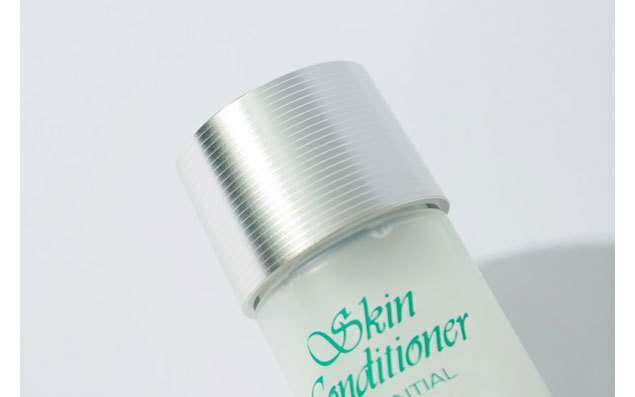 If you look through the reviews on @cosme, you might also notice some people saying that using SkiCon alone isn't moisturizing enough, or that it's too refreshing and dries out the skin. 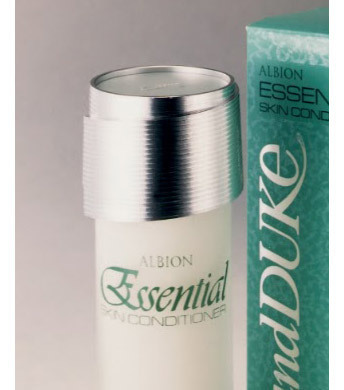 There's a connection here to the fact that ALBION lotions were originally intended to be used after an emulsion. "The skin needs to have a balance of water and oil. If you use SkiCon alone and your skin feels dry, then the skin care steps you use before or after may not be enough for you. 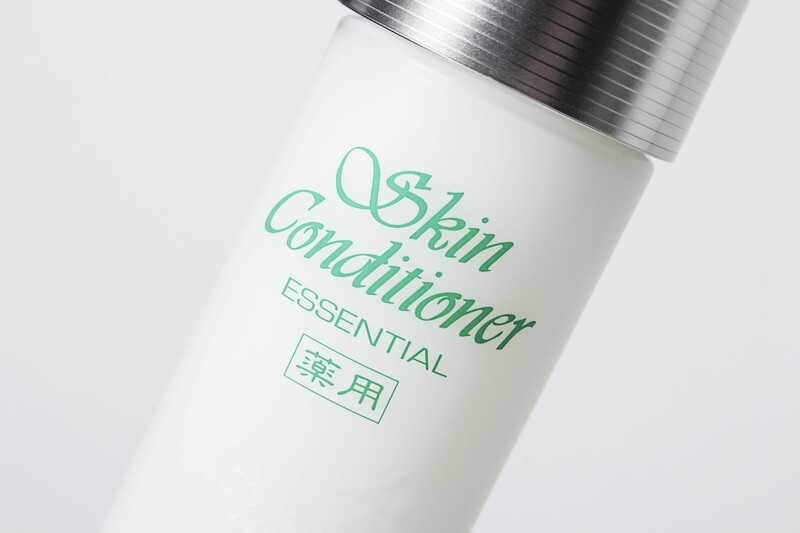 If you use it after an emulsion, then a cream afterward, I think you will notice that the skin's water and oil content feels completely replenished," said Ms. Nikaido. "When my skin was acting up, my mom told me to use this." Many users of SkiCon got their start with the product when friends or family who loved the product recommended it to them. "We have mothers bring in their daughters who are struggling with acne, or wives who come in to buy something for their husbands. We've had three generations of family members who are all devoted fans," said Ms. Otani. Something you just can’t resist recommending to others – SkiCon's amazing appeal as of May 2018, @cosme has over 24,300 reviews of reviews of Skin Conditioner! Thank to all of these reviews, SkiCon won Grand Prize in the 2000 Best Cosmetics Awards and 1st place in the lotion category. 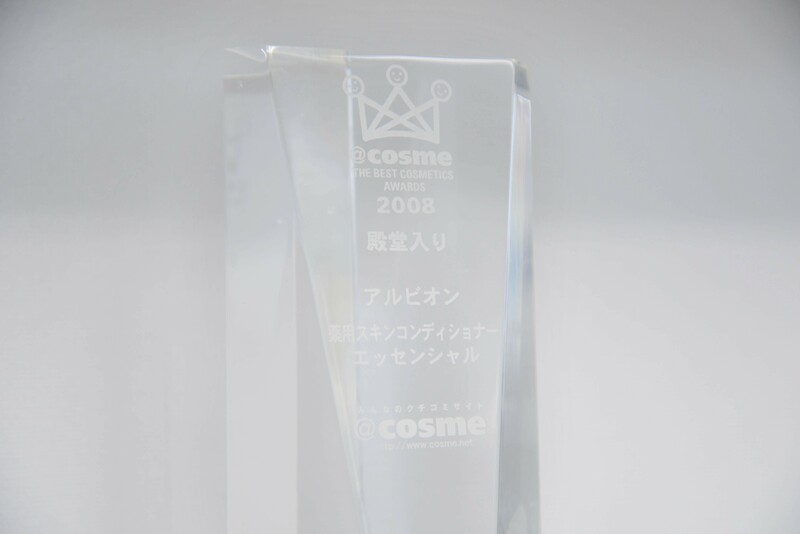 In 2001, it placed 1st in the same category, eventually entering the Best Cosmetics Hall of Fame in 2008. SkiCon is famous for its high rate of repeat buyers. Of course many people purchase a second bottle, but many users come back to it after a long time and rediscover how good it is all over again. Some people comment that they've flirted with other products before, only to come back to SkiCon in the end. "We really appreciate it. I think there are probably many people who experienced good results in the past and that memory stayed with them. 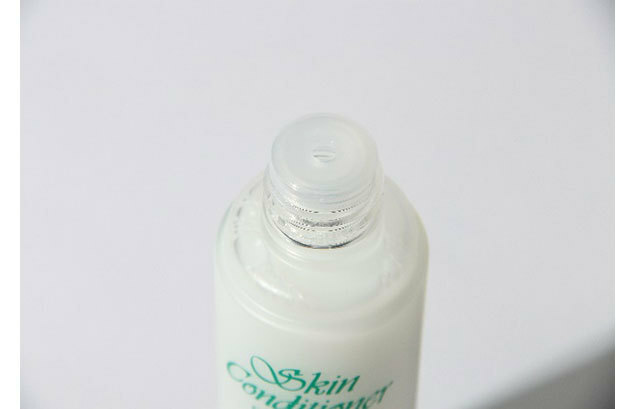 Whether it was the scent, the texture, or that their skin looked more beautiful, it's often difficult to pin down exactly why users of SkiCon think of the lotion so fondly," said Ms. Nikaido. Where did the SkiCon nickname come from? Why the irregular bottle sizes? In Chapter 4, we've collected a few fun facts for you. Knowing more about SkiCon might just make you a bigger fan! 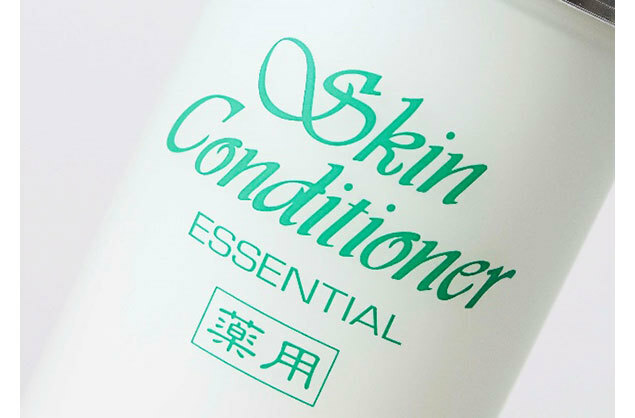 The nickname SkiCon isn't going anywhere now, but was it always called "Skin Conditioner Essential" or was there other contenders? 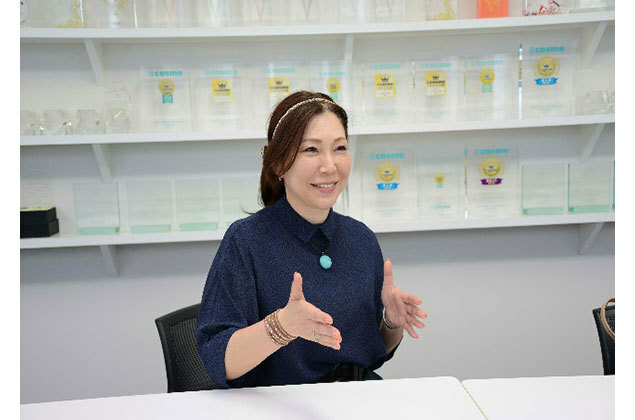 "In fact, when we were working on the product name before its release, 'Job’s Tears Essential Oil' was one possibility under consideration," said Ms. Nikaido. 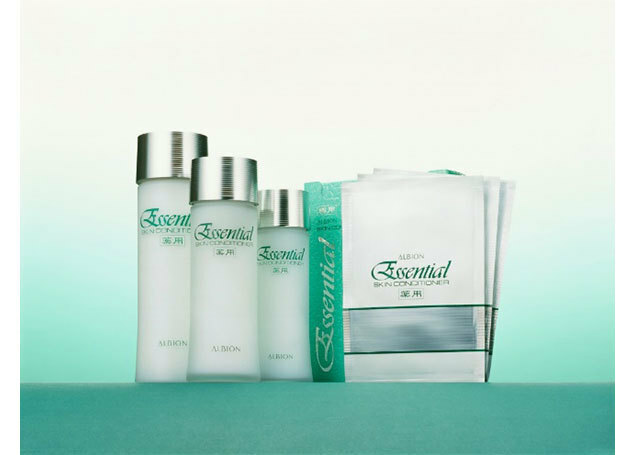 As it contains oil and is more than just a simple lotion, the word "essence" was also considered for inclusion. If we had gone with one of those, the nickname SkiCon might never have come into existence. Looking back now, it seems like "SKIN CONDITIONER ESSENTIAL" was the right choice after all. "When we looked into the roots of the word SkiCon, it seemed to have come from an abbreviation used in the company's customer files," said Ms. Nikaido. 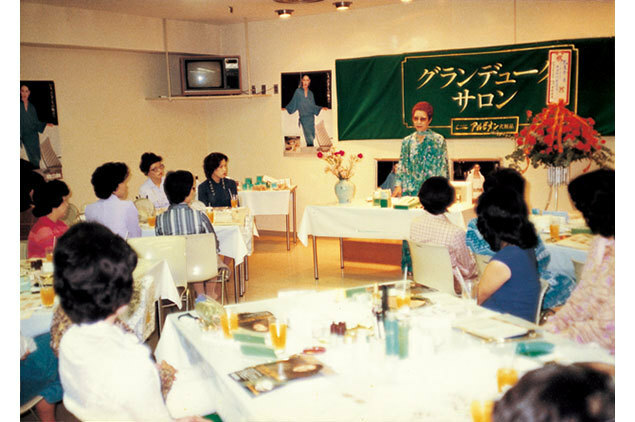 When SkiCon debuted 44 years ago, the trend of abbreviating names hadn't taken hold in Japan. As the lotion started to sell better, someone seems to have shortened the product name to SkiCon in order to save space in customer records. There are currently three different sizes of SkiCon: 110ml, 165ml, and 330ml. So why do these sizes seem to be a bit inconsistent? "Originally, the sizes were divided more evenly, with 100ml, 150ml, and 300ml. When sales tax was introduced in 1989, we increased each of those sizes by 10%. 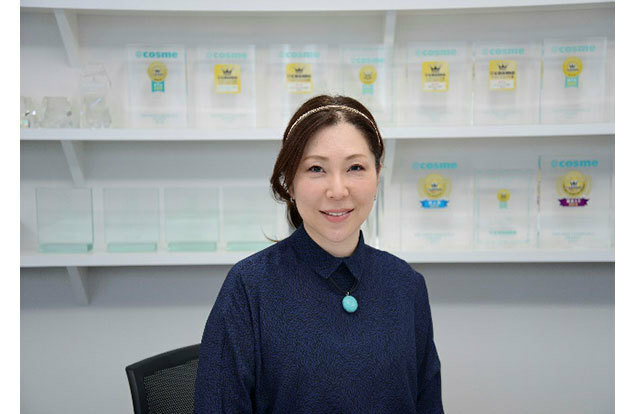 Our customers had grown to love SkiCon, so we wanted to pay back that support by making up for the price increase caused by the sales tax," said Ms. Nikaido. For those users who find the lotion's unique scent unpleasant, the company introduced a mildly scented "Mild Note" version in 1993. 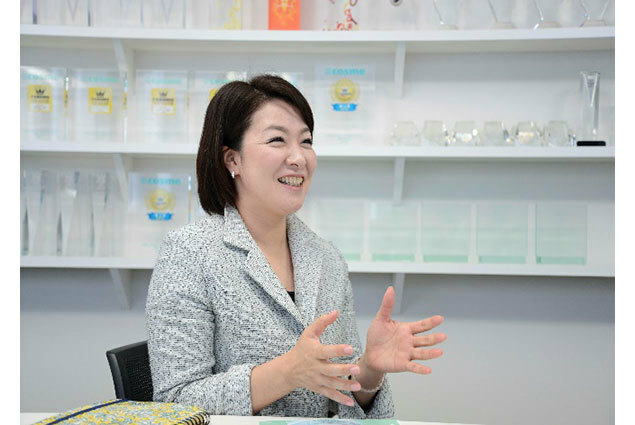 "It was actually the same formula except for the fragrance, but some customers said that it didn't sink in to their skin as well, or that it didn’t feel effective," said Ms. Nikaido. Sadly, the Mild Note version was discontinued in 2002. It wouldn't be SkiCon without that signature scent, would it? Another fleeting product in the ALBION lineup was a bath additive that came out in 1991. 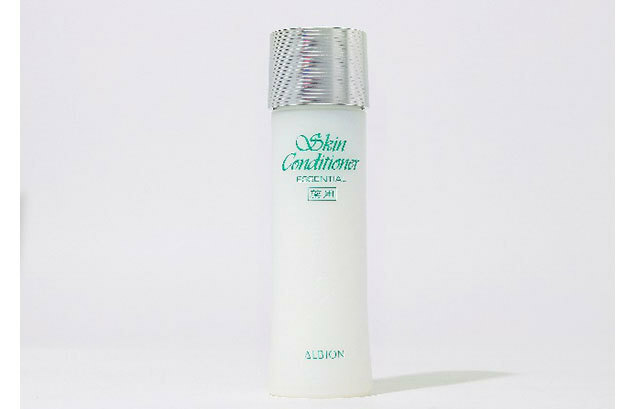 Created for customers who had been asking for a way to use SkiCon on their whole body, this product was discontinued in 1997. Makes you wonder whether these products would make it in today's market! 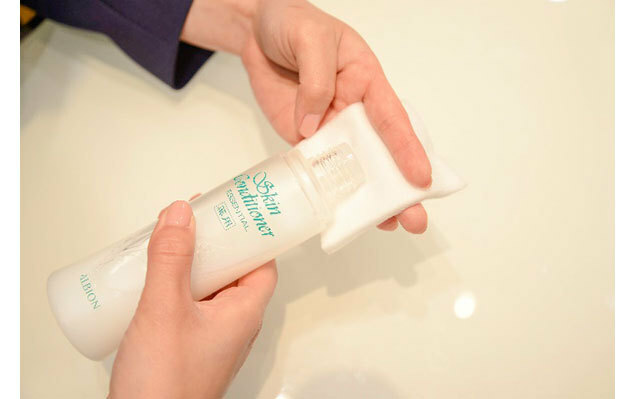 The Job’s Tears that have been part of the SkiCon formula since its debut have been sourced from within Japan since 2011. In 2017, they upgraded to organically grown product, while at the same time updating the method they had used since 2011 to obtain the Job’s Tears extracts used in the lotion. "Job’s Tears grains are very hard, so we used a so-called 'BAKUSAI (blasting)' method to obtain the greatest possible amount of the active ingredients from each grain. 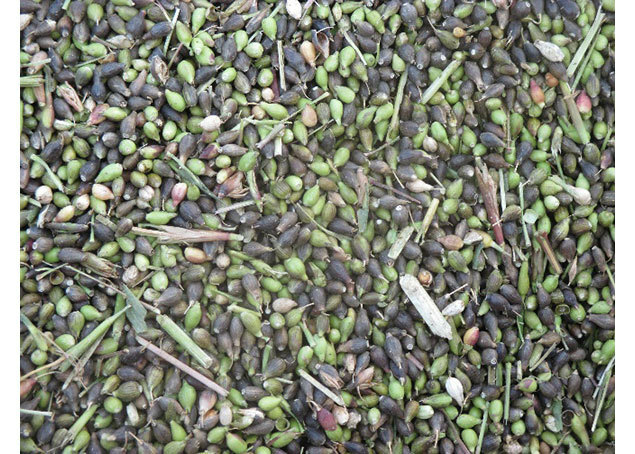 Each hard grain is instantly ruptured, like popcorn, which has maximized the efficiency of extraction," said Ms. Nikaido. If you look closely at the bottle cap of SkiCon, you will notice that the silver material has a horizontal stripe running across it. This design has been present since the GrandDuke series of products was released. "At the time, the high-end GrandDuke series was focused on having a more luxurious design. It's more 3D than the current design and said to be inspired by the ‘obi’ belt used for tying kimonos," said Ms. Nikaido. As soon as she told us, it was easy to see how both the shape and the elegant, glossy finish looked like a formal kimono's obi. The stripes on the current bottle design are left over from the original. Even simplicity evolved with the times. ALBION AD/PR Manager. From skincare to hair, body care, and makeup, she is an expert in every area of ALBION's philosophy, company history, and product lines. She leads a busy working life packed with finding ways to share the benefits of ALBION products to as many people as possible. ALBION Human Resources Development Department, HR Development Manager. She initially joined the company as a beauty advisor, and her 27-year career includes 7 years of educating human resources at ALBION. She spends her days educating employees and salespeople about ALBION's products and the ALBION customer service philosophy is filled with her passion. ALBION Department Store Division Beauty Advisor. Interested in the beauty world since her school days, she graduated from a cosmetics program at beauty school before joining ALBION. 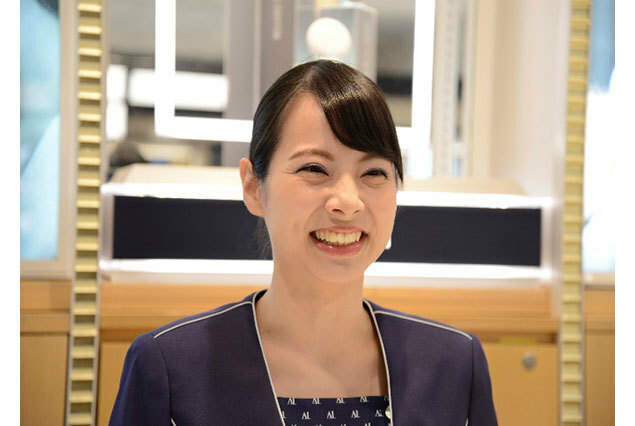 Working every day with a smile on her face, she works diligently to provide personalized customer service to the many foreign and Japanese customers who visit the Isetan Shinjuku ALBION counter.